There are many things I often reminisce about my trip to Miami. The clear warm turquoise water, running my fingers through the fine sand, smelling like the beach, the cold refreshing drinks, and....this pizza. I know it might sound weird, but when I saw it on the menu I knew I would fall in love. I love finding unexpected ways to incorporate eggs into dishes and this one is a definite winner. The one I had in South Beach had some hard boiled eggs, mushrooms, and other goodies I can't remember. I decided to switch things up and put my own spin on it. 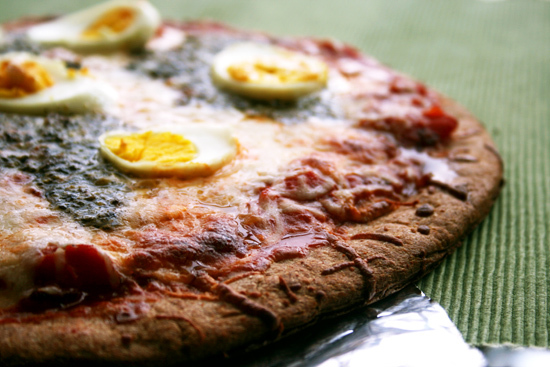 I chose pesto and hard boiled eggs on my pizza— simple flavors so that the eggs will really shine. The pesto really added a nice flavor with the eggs, gooey cheese and hot tomato basil marinara sauce. Is there a dish that you've had dining out that you can't wait to try at home? 2 Slice already cooled hard boiled eggs into thin slices, keeping the yolk and egg white intact in each slice. Set aside. 3 Spread marinara evenly onto pizza dough. 4 Sprinkle the mozzarella cheese Next, dollop some pesto wherever you want it. Top with egg slices and pop into oven for 8- 10 minutes. As you said, very unexpected combination...but it looks delicious and sounds divine! This is a great idea! We love eggs in the family and who doesn't love pizza? How clever! Love the twist on ordinary pizza toppings :) Yum! Oh yes! I love eggs on pizza! Every pizza should have egg on it, hahaha, well maybe not every single one! But this eggs+pesto combo sounds divine! what a great culinary souvenir to bring back from Miami! This is genius! I love boiled eggs (although a little gooey) but hard boiled ones would be wonderful on this. Can't wait to try it out. Thanks for the inspiration! what an interesting addition to pizza. I have add a raw egg to pizza and baked it, but frankly didn't love that. I think I would like this better. I've had this pizza called Sunshine pizza that had eggs and bacon on top. I love yours too! Eggs on pizza is so delicious, I'm surprised it's still so uncommon in the U.S! And I'm toally digging the flavor combo: pesto, egg and marinara sauce. The pesto sounds so good! & what a beautiful picture to tempt. Eggs on pizza are a natural combo. Eggs and pesto -- inspired! Maybe these are the original green eggs...? If so, I would certainly like them. guess what two things i've never had on a pizza--you got it, eggs and pesto. that's not to say i wouldn't enjoy them, because i would. very much. lovely creation! I like adding eggs to everything too! This is a new one and I will definitely give it a try! This pizza sounds so good! Hard boiled eggs on pizza is pretty big in Italy! I love your pairing it with pesto! Join, post your comments. Share your recipes! I'm into it! I had a sort of sunny-side up egg on a pizza not long ago and it was delish, so why not hardboiled? Fabulous pizza - great idea to add pesto and sounds so delicious with eggs! Very creative! I usually use pesto instead of tomato sauce, but I've never thought about adding hardboiled eggs. Ok this must be the pizza with egg on it you were talking about. Looks delicious!